Developed and Published by Double Damage Games. Released October 20, 2015. Available on PC, PS4, Xbox One and Mac. Review code provided by developer. 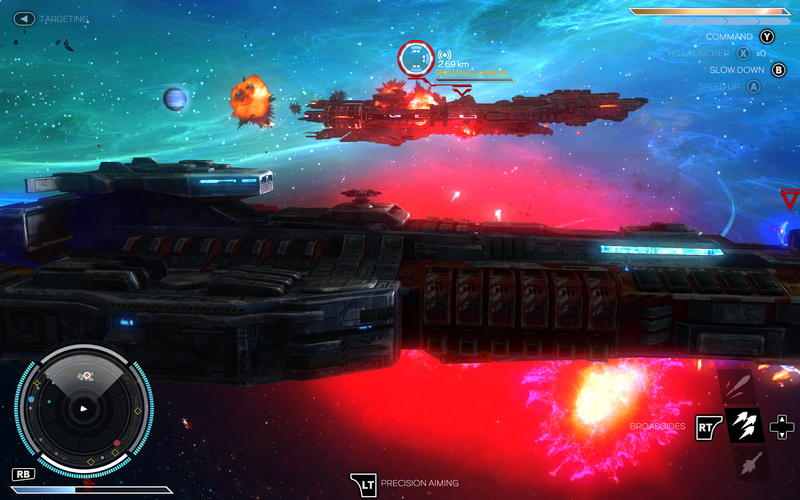 Rebel Galaxy is what happens when you combine the exploration and freeform nature of Sid Meier's Pirates! with the broadside-oriented ship combat of Assassin's Creed 4: Black Flag, and the "cowboys in space" setting of Firefly and Cowboy Bebop. As Captain Kirk famously remarked, space is the final frontier-and what better way to present a futuristic space setting than to introduce classic Western elements into the mix? Despite the lack of a compelling story, the game mostly does it all, and it doesn't bog the player down with the complexities often associated with space sims. With its freeform nature, players can forge their own way out in their galaxy-ignoring the storyline and embarking on highly profitable careers as outlaws, traders, or bounty hunters. Developed by the makers of Torchlight and its sequel, Rebel Galaxy cuts away the fat found in other freeform space games that rely on procedurally generated content. Gamers daunted by the complexity of the X series of games or EVE Online won't have to worry about managing massive spreadsheets or the logistics of running a business empire. By and large, the game revolves around ship-to-ship combat. Players will often encounter hostiles when traveling from one destination to the next. 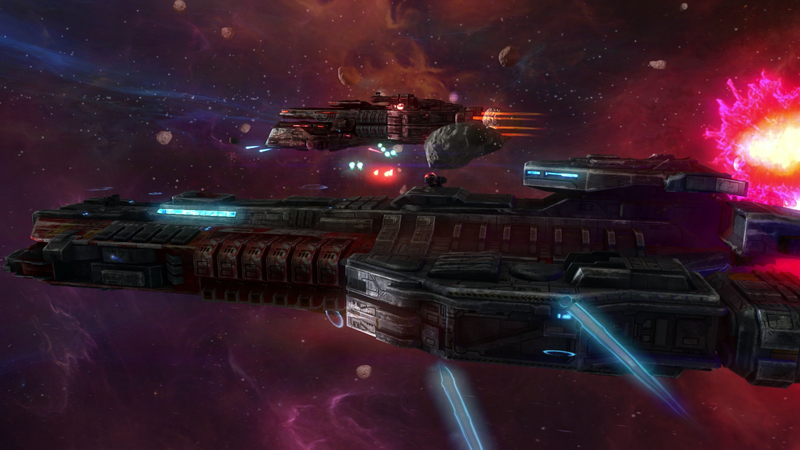 Differing from many other space games, players control capital ships and not fighters. Combat plays out on a flat plane, simplifying matters. Ships move fast and turn on a dime, so the combat is fast paced and is perhaps less tactical than games that allow you time enough to consider your moves. While piloting the ship, players take manual control of broadside cannons and ancillary turrets to directly target enemy vessels and incoming missiles. When not under direct control, AI assumes control of secondary weapons. In spite of the game's simplicity, there remain a few poorly explained elements. I was left to discover, on my own, that the secondary weapons had multiple AI settings accessible only through the escape menu. Beyond controlling weapons, players must also decide when to activate deflection shields. With this blocking mechanic, the game can sometimes feel a little like Dark Souls. Given how difficult some of the hostile encounters are, especially early on when you don't have much in the way of weapons and armor, it's necessary to shield the ship from bombardment when you need to and not rely on the thickness of your hull. It bears mentioning that early on in my playthrough, I spent a lot of time running away whenever I ran into significantly challenging groups of enemies. Despite carrying low threat ratings, I found myself in extremely unfair situations-and this all happened in the game's first zone. The game got a little easier when I earned enough credits to upgrade my ship, eventually affording to replace it with even better ones. There's a broad selection ships to pilot and equipment to arm them with, ranging from a wide variety of cannons, missiles, flak and mines. 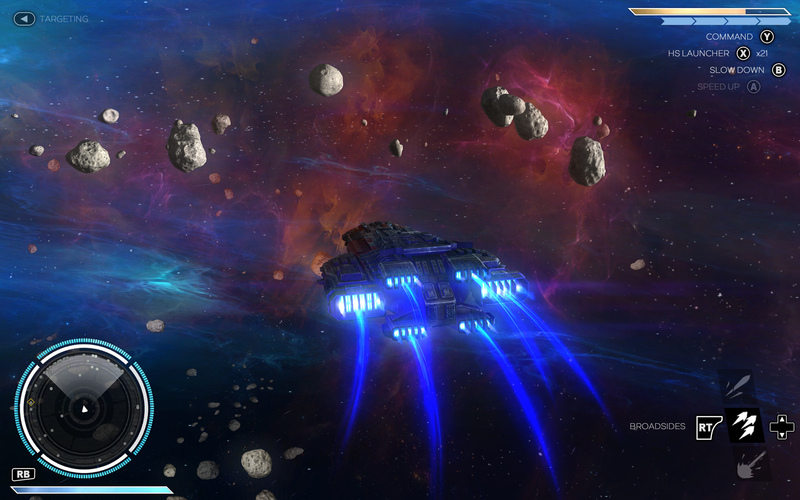 In addition to a few utility-based upgrades like tractor beams and deflection shields, you can upgrade the armor, engine, and warp drive of your ship that generally make life in Rebel Galaxy easier. 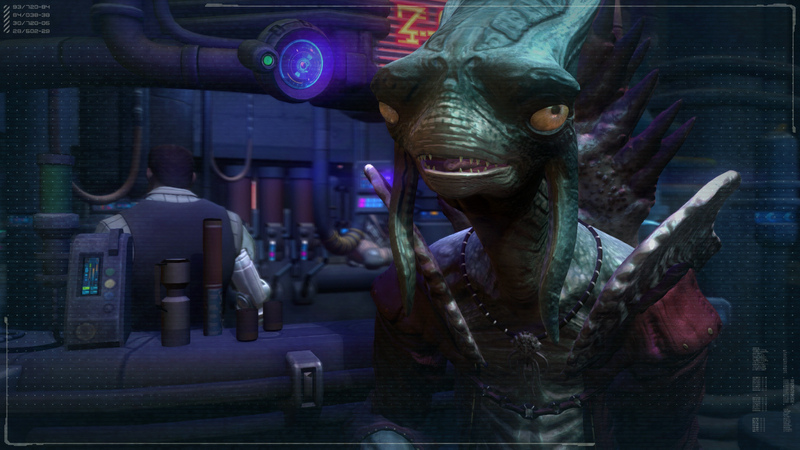 To earn credits, I took on bounties to hunt space outlaws and even tried my hand at commodities trading and mining. There's plenty of that to go around in the procedurally generated galaxy. It always came back to ship-to-ship combat for me, though. I've never been much of a trader, so spending any amount of time exploiting commodity prices didn't really appeal to me any more than manipulating the stock market appealed to me in GTA 5. Likewise, extracting ore from asteroid fields isn't anywhere as challenging or fun as taking on a fleet of hostile space pirates. It's necessary to partake in these side activities if you expect to make any headway into the story campaign, with progress gated by the difficulty of the enemy ships you encounter. However, because the combat is fun, collecting bounties to upgrade your vessel doesn't really feel like a grind-not that you'll really care, because the story isn't anything to write home about. 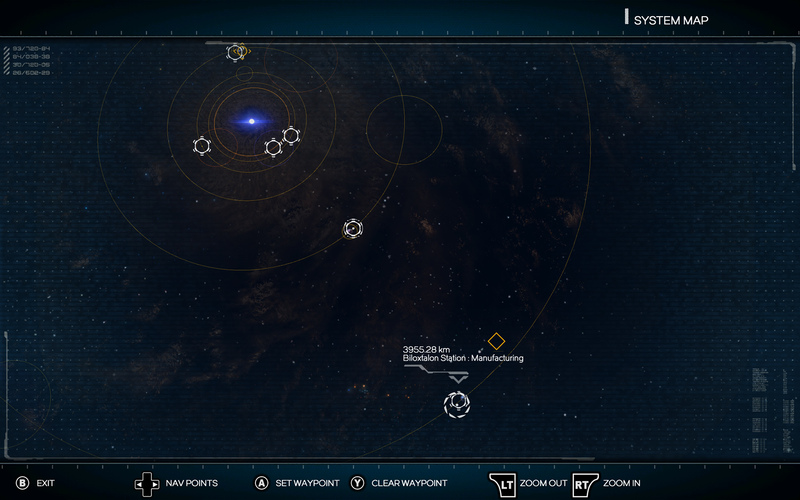 The story missions take players to various solar systems, connected through jump gates. There are various factions that populate these regions, but the only thing you'll care about is whether they're hostile or friendly. There's little in the way of politics to keep you engaged in that regard. Despite the game's largely freeform nature and scope, the same can't be said about the story, which seems almost like an afterthought given how easy it was to ignore while I scoped out bounties and other opportunities. The voice acting and writing are respectable, but not memorable. The thing that kept me playing was the combat, not my interest in the campaign. You'll probably find yourself creating your own story. 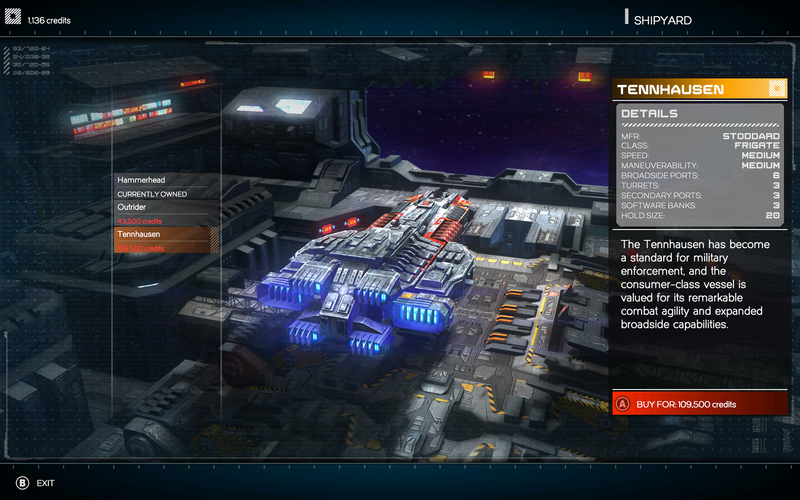 Bottom Line: Rebel Galaxy offers an exciting, if streamlined experience of commanding a large spaceship with a heavy focus on combat. It doesn't do much with the story beyond inviting you into its universe, but the gameplay, Western-inspired setting and procedurally generated nature will keep you playing for many hours. The music is also a plus!